Oscar foreign-language contenders include Angelina Jolie's Cambodian-language "First They Killed My Father," Chile's "A Fantastic Woman," and Palm d'Or-winner "The Square." The final deadline for submitting each country’s film for consideration for the foreign-language Oscar was October 2. Last year 85 were finally deemed eligible by the Academy; this year the number is a record 92. Haiti, Honduras, Lao People’s Democratic Republic, Mozambique, Senegal and Syria are first-time entrants. These films are vying for the initial shortlist of 9, and final five nominations to be announced on January 23. See the final list below. The frontrunners include Sweden selected Ruben Östlund’s hilarious Palme d’Or-winner “The Square” (October 27, Magnolia Pictures), an art-world satire shot in majority Swedish with some English from stars Claes Bang, Elisabeth Moss, and Dominic West, thus giving Östlund another shot after “Force Majeure” was a surprise 2015 Oscar omission. Germany’s choice, Fatih Akin’s “In the Fade” (December 27, Magnolia Pictures), won Best Actress for Diane Kruger at Cannes. Netflix backed director Angelina Jolie’s ’70s Cambodian-language Khmer Rouge wartime drama “First They Killed My Father,” which played well at Telluride and is the Cambodian entry; Jolie is a citizen. Also playing well at Telluride was Ziad Doueiri’s “The Insult,” which is Lebanon’s official entry. As always, Sony Pictures Classics offers some of the best-reviewed movies at the fall festivals. Berlin debuted the Chilean entry, Sebastián Lelio’s transgender drama “A Fantastic Woman,” which won Best Screenplay and played well at Telluride and Toronto. Cannes critics raved over Russian filmmaker Andrey Zvyagintsev’s moving, intense family drama “Loveless,” which did win a Cannes jury prize, if not the big one and played well at Telluride and Toronto; for the third time the Russian Oscar committee selected a film by independent-minded Zvyagintsev, despite the way he shows an unflattering mirror up to a society overrun by ministers demanding upbeat portraits of their culture. As always, Israel submits for the Oscar the winner of the Ophir: this year’s it’s Samuel Maoz’s “Foxtrot” (Sony Pictures Classics), a portrait of grief, fate and loss, which played well at Telluride and Toronto. Austria picked Cannes competition title “Happy End” (December 22) which reunites the Oscar-winning “Amour” father-daughter team of Jean-Louis Trintignant and Isabelle Huppert. Michael Haneke’s bourgeois family saga may be too dark to get shortlisted for the Oscar. Brilliant but brutal, “Happy End” is not as accessible and moving as “Amour,” despite strong performances. 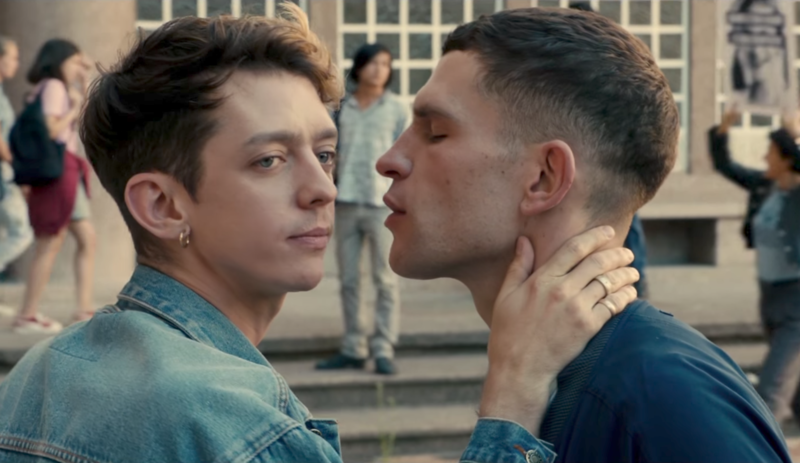 The French Oscar candidate is Robin Campillo’s moving portrait of the ’80s AIDS epidemic in France, “BPM: Beats Per Minute,” which took home the Cannes Grand Prix and was acquired by The Orchard, which is also releasing Joachim Trier’s Norway submission, the sci-fi thriller “Thelma,” about a woman falling in love who has fantastic powers, which debuted well at TIFF. In case you were wondering, Oscar rules dictate that while countries around the world may submit a movie in any language other than English, even if it’s not the official language of that country, American filmmakers cannot submit a foreign-language film made stateside. Thus A24’s “Menashe,” filmed primarily in Yiddish, is not eligible.